My son, Sam (7), has been fixated on and off, mostly at night, about what he calls my “dumb decision” for the last couple weeks. What was this error in judgment? Taking him to California in February. The four of us tagged along on a business trip with Daddy and had a fabulous time. We spent two nights in Napa Valley and two nights in San Francisco. 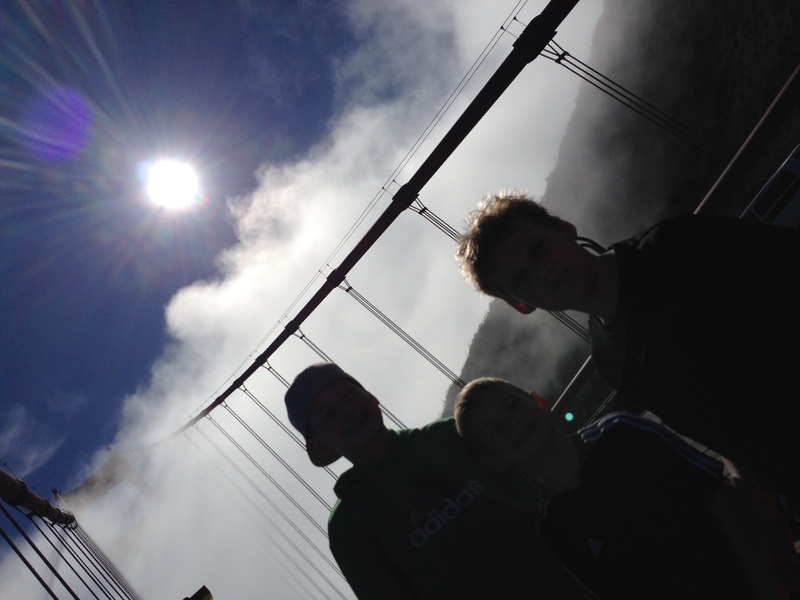 We got to hang out and bum around and do lots of new things like walk on the Golden Gate Bridge (pictured above), see 1000 year old trees, and eat sourdough bread that’s been baked just the same since 1849. We explored the city mostly on foot and the boys brought along a basketball, shooting hoops at Joe DiMaggio park when they were tired of sightseeing. The weather was warm and sunny in the afternoons and it was lovely, beyond lovely. At least I thought it was, until Sam decided that going at all was a “dumb decision” because we also visited Alcatraz. Yes, my darling was scarred by “the rock,” like really scarred. And the sad part is he didn’t say much about it at all when we were there. He’s a slow processor and often brings things up weeks, months, even years, after the fact. It’s really odd — I don’t ever remember his brothers doing anything like that. So, until ten days or so ago I would’ve thought all was well. But then he started saying before bed that he was scared he might have a dream about Alcatraz. He started asking questions about it revealing how much the whole thing impacted him, how much he’d been turning all of it over in his little mind. “So, they were only allowed to go to the library if they were good?” Yes, Sam that’s right. “Why were those guys on the beds like that? Were they dead?” Oh, Sam those guys were trying to escape and they wanted the guards to think they were still in the bed. They weren’t real people, just stuffed clothes like. “Remember where the grenade went off? Why wasn’t it a bigger mark?” I do remember that and I don’t know. “So they couldn’t go outside except in that one spot?” That’s right, Sam. But Sam it’s been closed a long time. It hasn’t been a prison since before Mommy and Daddy were born. A faint smirk, a small sign of hope washed across his face. Telling Sam to just get over it doesn’t seem to be an option. Does delegitimizing others’ fears ever really work? Whatever the fear is it doesn’t need to make sense to us to sympathize. We can try to reason and listen and encourage, but some fears don’t die just because they are irrational. In fact, I had a morbid fear as a child of a scene from a movie. If someone enacted this scene today I still wouldn’t like it. And it didn’t matter how many times I was told that this fear –and my crazed reaction — was silly, my fear remained. You know what finally helped me? Believing in my heart that God is with me, that He has a plan for my life. That I am not ultimately in control. May I stop trying to steer the false reins of my life, and instead offer my hand to Him willingly each and every day.